LOS ANGELES – A federal judge Monday banned former Los Angeles County Sheriff Lee Baca from wearing a small lapel pin of a sheriff’s star during his forthcoming retrial on corruption charges, but a decision on the ex-lawman’s cufflinks is pending. During an hour-long motions hearing, U.S. District Judge Percy Anderson granted the prosecution’s request that Baca refrain from wearing the tiny six-pointed sheriff’s star on his lapel, as he has done for every court appearance since charges were first filed against him one year ago. “He uses it to communicate to the jury,” Assistant U.S. Attorney Brandon Fox told the judge. In court papers, Fox argued that in sporting the star, Baca is sending a subtle message to jurors that he is an honorable, law-abiding former law enforcement official who has the support of the department. Defense attorney Nathan Hochman argued that the lapel pin is similar to a class ring or an insignia and has no power to prejudice the jury. According to the government, the 74-year-old former lawman “essentially testified” without taking the witness stand or being subjected to cross-examination by wearing the small badge during the two-week trial that ended Dec. 22 in a mistrial. Using the quarter-sized pin, Baca “attempted to cloak himself with the credibility, authority and support of the Sheriff’s Department,” prosecutors contend in court papers. The pin “was barely visible to the jury, if at all,” Hochman wrote, pointing out that his client sat 20 to 30 feet away from the jury box. Anderson, however, ordered that Baca not wear the pin in the presence of jurors in any situation where he may come into contact with the panelists, including the courthouse cafeteria. 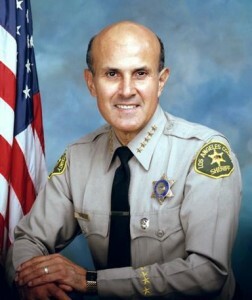 A short time later, Fox noticed that Baca was wearing cufflinks adorned with the sheriff’s star and brought it to the attention of the judge, indicating that the decorative jewelry should also be banned. The judge is expected to issue an order including the cufflinks along with the lapel pin. Another motion involving defense allegations that, in retrying Baca for obstruction of justice, the government is illegally exposing him to double jeopardy was apparently rejected by the judge at sidebar. Still pending before Anderson is the government’s motion to preclude testimony by defense expert witness Dr. James Spar, a psychiatrist at UCLA who could testify about Baca’s mental health. Baca’s attorneys say the former sheriff is in the early stages of Alzheimer’s disease. Anderson indicated that jury selection will begin either Feb. 21 or 22, with about 245 potential panelists summoned to the new downtown federal courthouse. The judge said jurors would remain anonymous due to the media attention the trial is expected to draw and to lessen the chance that they are contacted during the proceedings. Baca was tried in December on the two obstruction charges, culminating with jurors deadlocked 11-1 in favor of acquitting the former sheriff. Anderson then declared a mistrial. Baca is accused of conspiring to commit, and committing, obstruction of justice from August to September 2011, partly stemming from an incident in which two sheriff’s investigators confronted an FBI agent involved in the jail probe in the driveway leading into her apartment, and falsely told her they were in the process of obtaining a warrant for her arrest. 2 comments for "Judge rules against Baca’s lapel pin, cufflinks pending"
LOL , like it is really going to impact the jury. This is so funny because when they refer to him during the hearing they say former sheriff Baca. Someone on the case has been watching alot of the new CBS show Bull.